Last month I unveiled a brand new ‘Sisters For Sale’ poster design, and offered the first ever print to whoever could decipher its meaning. The design was shared via my blog, the front page of Imgur, and (thanks to our amazing promotion team of Melissa Adams, Katie Carriero and Astrid Hofer!) across Facebook, Instagram, Pinterest and Twitter. We had an amazingly positive response to the design, and I was fascinated to see that such a seemingly simple image can mean so many different things to so many different people. Among the one-word interpretations of the poster’s theme was everything from “innocence” to “bureaucracy”, “enlightenment” to “warriors”, “hope” to “journey”. More than one person saw the poster as a reference to the Judeo-Christian valley of the shadow of death. I’ll tell you what this poster means to me. 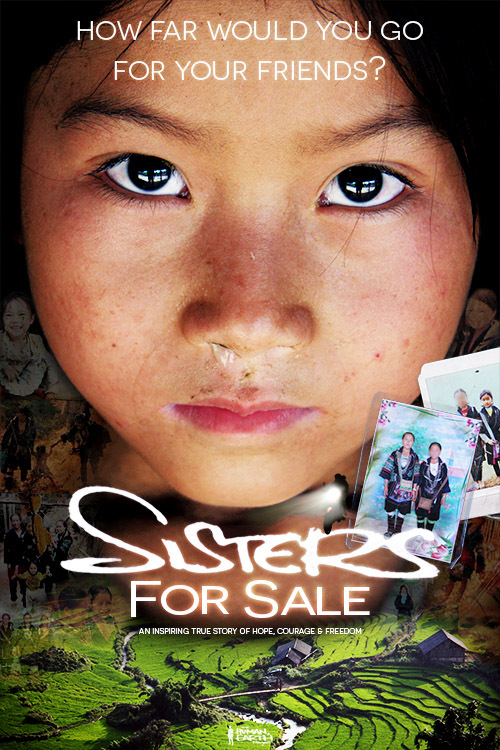 The original, cinematic poster I shared last year was focused on the human trafficking crisis at the centre of ‘Sisters For Sale’, depicting the separation of a young Hmong woman from her home. This new, “classic”-style poster is a little different. With this design, I’ve tried to depict the position of Vietnamese Hmong women in particular, and women in general. In a sense, it’s a reflection of my own journey with ‘Sisters For Sale’. When I first began work on the documentary, I was highly focused on the local human trafficking crisis, only to learn it’s just one thread in a much larger, more complex tangle of women’s rights issues. As mentioned, I’ve used four design elements to deliberately underscore this theme. Those of you who are familiar with the Vietnamese Hmong and their homelands had an advantage in deciphering some of these elements. The original poster was a complex design using a full colour spectrum. Here, I wanted a bold design with strong, simple colours. I see it almost like a battle flag, carrying with it the same ideals of strength, courage and unity. As the predominant colour, I chose the same colour that gives the Black Hmong people their name. 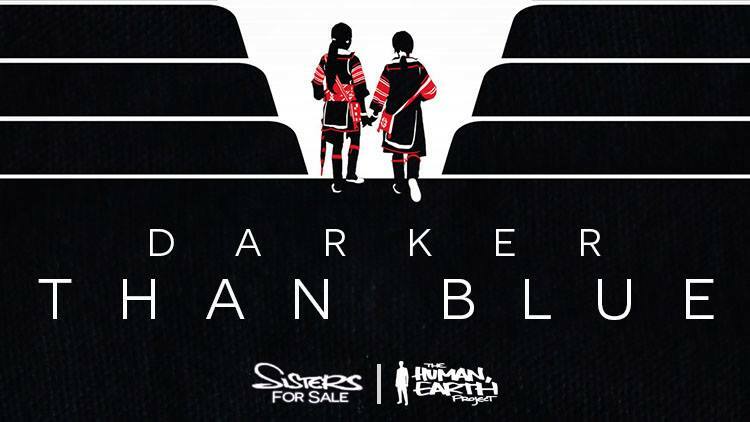 My kidnapped friends – the central characters in ‘Sisters For Sale’ – are Black Hmong people. As with other Hmong groups in Vietnam (such as the Red, White and Green Hmong) their name derives from the principal colour of their traditional clothing. It’s the Hmong women who labouriously spin, weave, dye, roll, stitch and embroider this clothing from hemp fibres. In reality, it’s not black at all – it’s a rich indigo, with highlights of red, green and white. Each time you see a Hmong person in traditional costume (as you will throughout ‘Sisters For Sale’), you’re looking at the unique handiwork of a Hmong woman who has poured months of her life into creating something which is not only beautiful, but also practical and resilient – much like the women themselves. I didn’t want the pinks or soft pastels which are seen in the West as “feminine” colours. That warmth and softness wasn’t the aspect of womanhood I wanted to emphasise here. I love the fact that these colours are exactly the opposite, a stereotypically “masculine” colour scheme of deep blue – almost black – with an aggressive slash of red. As a battle flag, it is female without being feminine. The particular costume photographed for the poster has a special significance, too. It was made by the mother of my trafficked friend Pang. Pang wore it on her first day at home in Vietnam – the first time she’d worn Hmong clothing in 3 years and 8 months – after escaping forced marriage in China. It is the clothing not of a girl, but of a woman; not of a victim, but of a survivor. It gives the poster not only its dominant colours, but also its subtle background texture. Unlike the original poster, which is designed to keep your eye wandering between several areas of interest, this poster is designed to capture your attention and focus it on the lower centre of the image. The strong lines of the valley walls and the vertical tagline form an arrow to draw your eye inwards and downward towards the central figures and the title itself – and to stop there, cut off by the red line across the bottom. The sisterhood between these two young women is very literally the focus of the design. You really can’t look at the top of this poster without bringing your eyes down towards them. Try it. The two young women at the heart of the image come from a photograph given to me by Laura Snape. Laura is a friend of May’s who was living in Hanoi at the time of May’s abduction, and made the first investigations into her disappearance. The image shows May (on the right) with one of her friends, Lee. I’ve redrawn them in the same bold colours as the rest of the design: they are individuals, yes, but they are also pieces of the larger fabric of womanhood. The title itself – ‘Sisters For Sale’ – tells you several things: it is a female story; there’s more than one woman involved, with a close bond between them; and the fact that they’re being sold indicates that circumstances are against them, and seem to be overpowering them. These two young women, positioned as they are between the dark and seemingly insurmountable valley walls, are a visual echo of that title. The obvious setting for these young women was the land where they have their roots – the mountains of northern Vietnam, with the distinctive stepped rice terraces that line its valleys. As I worked with the image, however, the valley walls began to steepen, and evolve into something else. I asked myself: What defines the role of these women in society? For what reason are they taken and forced into marriage? My friends were sold, essentially, as baby-making machines. They were reduced from human beings merely to wombs. And so the valley itself became the womb, which has both a light and dark aspect. Firstly, the womb as home, as a place of warmth and comfort, of creation. Secondly, the idea that these women are trapped in that role, of being wombs and nothing more. The walls of the valley are steep, and – if you look at the faded lines across the top of the poster – they seem to stretch forever. The women can’t seem to escape this role. As women – and particularly as impoverished rural women in a strongly male-dominated culture – they find themselves trapped in the bottom of the valley. They have each other, and otherwise seem very much alone. These are young women, coming of age, with wombs of their own. By placing them inside the larger, symbolic womb of the steep-walled valley, it becomes a sort of loop, a repetition, a Russian-doll situation. They were born into their role as birth-givers, like their mothers before them. This is not a new or temporary situation, but something that has continued down through the ages. This sense of repetition is echoed in the endless, identically-formed terraces, and even the line of white stitches that underlines the image, passing unchanged from one side to the other. If these women can’t climb out of this narrow space, not only will they remain there for the rest of their lives, but so will their daughters, and granddaughters, and so on. There was one final element I wanted to accentuate: the question mark. I wanted to make it bolder, and in a different style, to disconnect it somewhat from the tagline above, to make it a question in itself. While the situation appears eternal and unchangeable, while women have been trapped in this position for generations beyond count, there is still a dynamic element in the design: the young women themselves. These particular women are just now on the cusp of entering the valley, of entering womanhood. It is something that is happening now, in the present moment, and is as-yet unresolved. They may not be comfortable there, but they have not been crushed – and they are moving forward, towards a glow that appears at an indeterminate distance. Unlike the cinematic poster, which has a key that explains everything else – the faceless motorcyclists, representing the traffickers – this design is left unresolved. The question mark still hangs above their heads. Not in an abstract “mystery of the feminine” sense, but in a very concrete way: Are these women strong enough to climb out of this valley, can they rely on external assistance, or are they and their descendants destined to remain there indefinitely? It is a question which, for me, goes beyond these young trafficked women, beyond Hmong society, to all women – and to all men, who have built many of the barriers around these women, and are in a position to bring them down. I didn’t expect anyone to uncover so much meaning in the design. I was surprised, though, that nobody guessed the word I was looking for, especially as I’ve made no secret of my feelings on women’s rights issues. Leonie Brok came closest with her theory of sisterhood, and will receive the very first print of the poster. I’d like to share some of the other unique and beautiful responses I received. I’d like to thank all of you who took part in the contest, and really enjoyed reading all your submissions. We’ll be running another little competition for you soon – stay tuned!